With the opening of our new Showroom and gallery, along with our involvement with the Robert D. Mazur Scholarship Fund we have been fortunate to receive lots of support from our local media. On Monday, November 2, I had the pleasure of being interviewed by WSPD talk show host Fred Lefebvre on his morning show. It was my first experience with live radio. Here follows the conversation. FL: In the studio with me is Laura Jajko. Laura has American Frame down in Maumee. Now you've been there a while, right? FL: So they blended the two? LJ: They blended the two. The custom metal frame came on the market in the early ‘70s and my dad thought this would be a perfect product to send via direct mail to artists. So he took out an ad in the back of American Artist magazine. He forgot about it. A couple weeks later the post office is calling him saying, “Mr. Mickel will you please pick up your mail?” So he goes there and he finds all these orders spilling out of the mailbox. He closed the hardware store and they had an art gallery as well and opened a direct mail business at the time. FL: Wow- that’s amazing! Now you’ve gone from the direct mail and working in your dad's garage to a much bigger brick and mortar building. You’re in Maumee, right? Where are you located? LJ: We're in Arrowhead Park. We’ve been there since the early 80's. I believe that my father was the first to build there. It was a lucky choice because eventually UPS put their Midwest hub there and so it allows us to serve the country and even some parts of the world very efficiently. FL: So the basic service stayed that way for a long time right? The mail order business? But now you’ve expanded and the reason why we have you on is because you have some job openings. Tell me about the expansion. LJ: We're a direct mail company but we’ve always had a small factory showroom where artists and photographers who were doing their own framing would come in and pick up their work or work on their designs and a couple years ago we couldn’t believe what we witnessed in that space. It was over the Christmas season and it was a tiny space not much bigger than your studio, and they were coming in and they were socializing and helping each other frame their work, reconnecting with friends, making new friends and before we knew it the place was packed, my staff was going crazy and we were like, "Wow this is a really meaningful service we're proving here." FL: So a lightbulb went off? LJ: Yes! It made us rethink how we want to participate in the community and what we want to mean in the community. So we decided to reimagine the modern frame shop experience and try to create a community hub for the arts in our space. FL: So that’s what you’ve done. The space looks enormous. I was on their Facebook page and you can go there too. 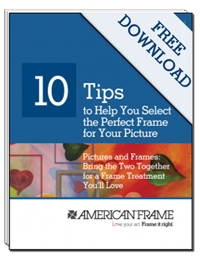 Or you can go to their website, americanframe.com, and you can get to their Facebook the same way. So how big is the space now? It looks like quite a few thousand square feet. LJ: It's about 3500 square feet. FL: Is it really? So there’s a lot more room to work first of all and a lot more Showroom space. And I see on your Facebook page that you’re actually going to be displaying artists’ work? LJ: Yes, we have a full gallery there. FL: That’s pretty cool. So that’ll give them a space that they don’t necessarily have right now, right? LJ: We are expanding gallery space; we are taking very low commissions. We are providing free meeting space for any kind of community group that needs a place to gather and we are also launching with a fundraiser on behalf of the Bowling Green State University foundation and the school of art. An artist that we personally collected as a family, Bob Mazur, who was head of painting there for a long time, passed away in August. So we are displaying a lot of Bob’s work right now. The Mazur family is very generously donating all the proceeds to the Bowling Green Foundation to build a scholarship in Bob's name for a deserving art student. FL: That’s really nice! So when is that event? LJ: That was last week but the fundraising is ongoing. FL: So if people come over today they will be able to see Mr. Mazur's work still on display? LJ: Yes and this is both in our gallery and we also have an online gallery for artists. FL: What are you hours down there? FL: Are you open at all on the weekend then? FL: And it’s in Maumee, right on Tomahawk drive. 400 Tomahawk drive. Now let's talk about jobs. So you have some job openings. What exactly are you looking for and what skills do I need? LJ: You can be pretty much anything to come work for us. I would say it helps if you’re a craftsperson. We need people in the plant to custom build picture frame orders and you have to be a nice person, a team player. We are looking for somebody to assist in the Showroom. We need an additional showroom attendant. FL: Would any kind of art background help? LJ: Oh yes, we love artists, yes! FL: Okay so I bring a photograph in, I’m just going to give it to you but you’re also going to recommend to me too, what kind of frame, what color frame, what size of frame, what style of frame. So an art background would probably help. LJ: It’s helpful but it’s not necessary. LJ: These are things we can train people on. A lot of people just have a flair for art and design but they don’t necessarily have a formal education. FL: How can they go about that? Do they just need to come in and fill out an application? LJ: Just come on in. Yes, absolutely. Schedule an interview. We need about 3 or 4 people right now going into the holiday season and hopefully we will keep that momentum and build from there. FL: Or their Facebook page- you’ll find everything there. You can go online and get all the info you need. You stop in and take an application with you and dress to impress, right? No baggy pants. FL: Come on, hold up the standards! FL: You’ll take somebody with baggy pants? LJ: I’ll take somebody with baggy pants - if they're good! FL: If they’re good! Is there a phone number they can reach you at? LJ: 419 893 5595. We truly appreciate this. It gives us the chance to invite the public to shop where the artists buy and enjoy direct pricing and high quality craftsmanship and quick service. FL: I love the idea that you have gallery in there that local artists will be displayed at because there are so many really good artists all throughout the Toledo area that have been working for years and years and I love the idea that you have a little gallery that the work will be on display all the time. So if you get a chance go down and take a look. Like I said they are at 400 Tomahawk drive down there in Maumee. Thank you so much for coming in today! LJ: Thank you for having me!